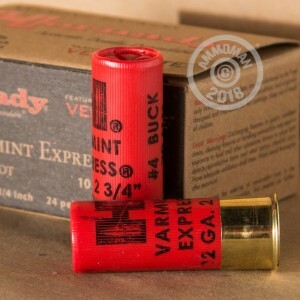 This buckshot ammunition from Hornady excels at quickly bringing down midsized varmints such as coyotes. 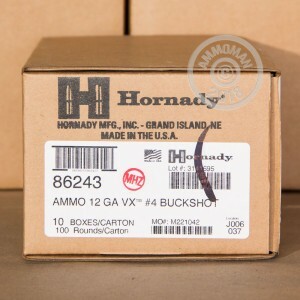 Each shell in this box of 10 fires 24 pellets of #4 buckshot at 1,350 feet per second. 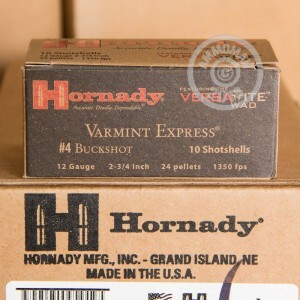 This setup combined with Hornady's VersaTite wad produces tight patterns even out to medium range and a very high hit probability. #4 buckshot is also a useful self-defense load in an indoor setting, as it exhibits much less penetration than 00 buck while still being powerful enough to take down a human attacker at close range. Place an order at AmmoMan.com for $99 or more to qualify for FREE shipping!